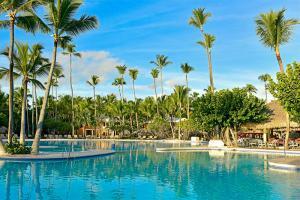 This charming Caribbean hotel is located just steps from the kilometer-long Bávaro Beach, where there are countless sporting and tourist activities within reach. The large hotel complex offers all kinds of amenities including swimming pools, a spa, meeting facilities, a commercial area with shops, a casino, bars, discotheques and a variety of sporting activities. There are 11 restaurants offering a wide variety of dining options. Enjoy quality local and international cuisine without leaving the hotel. The hotel has 11 buffet and à la carte restaurants and 14 bars serving snacks, soft drinks and alcoholic beverages.